During the time the Highway Patrol has been in existence the element of danger has always been great. A number of troopers have given their lives in the line of duty. The first traffic fatality was recorded on July 2, 1929, the day after the Patrol was activated. Patrolman George I. Thompson was killed while riding a motorcycle enroute to his assigned duty station. The relatives of every member who has worn the uniform of the North Carolina State Highway Patrol have a right to be proud. Every member, past or present, living or dead, has contributed to the success of this great organization. On May 18, 1986, on the grounds of the State Highway Patrol Training Center, a beautiful stone memorial was unveiled and dedicated to the members of the Patrol who have been killed in the line of duty. 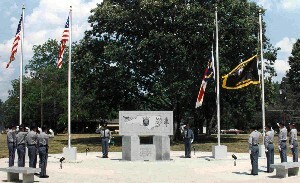 The monument's proposal, design and funding was accomplished through the diligent efforts of the North Carolina State Highway Patrol Auxiliary. As in life - the image of this memorial serves as a link to those who have given their lives in the line of duty.